I just thought I’d let you know what’s been going on in my life this past month or so. About a month ago, we had visitors at our office. One of our partners we’ve been in regular contact with in the U.S. came to visit us again (the last time he was here, which was also his first time here, was back in March) for the long weekend. And while he was already here, our contact in the Netherlands also came to visit. The week was a bit hectic, but it was nice to get to know each other and get a live discussion going of future developments and what each of us was going to work on (and preferably in which order). I’m not too keen on coming in to the office on weekends, but I can let that pass when it’s on rare occasions. I decided to leave early that Saturday so I could spend a few hours celebrating my cousin’s kid’s birthday party for the family (he turned 3 that day). It’s important to not burn yourself out. As a bonus, though, my boss treated us with tickets to Jugendfest that Saturday, which has become a local music festival. On that day, the highlight performance was Roxette, which some of you may remember from the 80’s and 90’s (at least I remember them well). It started to rain heavily towards the end of their performance, so even though I came prepared with a thin poncho, I got pretty soaked that evening. I also got myself a new phone. 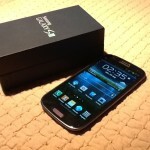 This time, I decided to go for a Samsung Galaxy S III. I spent a few weeks deciding on whether or not to buy it, and after making the decision, I used some unspent gift certificates to reduce the price even further. After spending a month with it, I still have no regrets on my choice. Simply said, I think it’s the best smartphone on the market today. And yes, that’s even after the new iPhone has been released. And regarding my trip to Oslo in November, I finally got around to book flights and hotel for the weekend. I arrive in Oslo at 5 pm that Friday (November 16), take the airport train directly to Oslo S (the central train station in Oslo, where I’ll be arriving at about 5:30 pm) and check in to my hotel, which would be Radisson Blu Plaza, a short walk from Oslo S. After checking in, I take another short walk to Oslo Spektrum, where Gabriel Iglesias will perform at 7:30 pm. I head back home on the 5:50 pm flight that Sunday. While I’m already in Oslo, I plan on visiting my friend in Oslo and his wife, but I’m also up for anything else to fill my time (if anybody reading this wants to meet up). But first, I’ll be preparing for my vacation in Berlin, which is less than a month away. And with even more added to the fan meet schedule on October 20, I’m getting even more excited as the day comes closer. Posted on 18.09.2012 at 16:18, categorized as blog.